You've made it! We've turned the last pages and digested the story, and hopefully you have an idea of what you are going to make from the inspiration you found here. Today we'll discuss our overall thoughts about the book, drawing out what we liked or didn't about it, and maybe even hint at our stitching plans? See some questions below to get us going... most are thanks to some reading guides online, with a couple of my own additions at the end. Always, add your own thoughts and questions in your comments so we can all talk about our reading experience. Would you like to go for a spin on the Merry-go-Round? Which direction would you go? Would you risk it? I'm not sure I'd risk it... although I did spend an evening this week going through a lot of old photos, and that did make me feel a little nostalgic about my youth, and how young and lively I looked in some of those old pictures. But I wouldn't really want to give up what I have now for another run through. I don't think. Why do you think so many townspeople were drawn to the carnival? What are they seeking? I feel like there were so many things that attracted people to the carnival -- everyone had their own reasons for regret and hope for a do-over. Mr. C feeling nostalgic for a long-gone cotton candy scented childhood; Miss Foley for youth and romance; even Mr. Holloway wants restored youth and vigour like that of his very young son. It was how Mr. Dark could twist these desires that was so interesting. Bradbury’s book is nostalgic, but can we still connect to that nostalgia? Do we experience the book as earlier generations of readers did? Even though I love this book I do feel there is a certain innocent nostalgia that our more cynical selves might find a bit quaint these days, at least to some extent. The glorious boyishness and innocence of Jim and Will's desire to be grown up, to be their interest in adult relations etc. seems very young to the modern eye. I'm not sure we have the same kind of response as original readers might have, but I think that this book still holds up and that there are many concepts that still provoke thought, contemplation and curiosity. The male characters of the book, in the beginning at least, are all looking forward or back to a narrow sliver of time as the prime of their life. Why, in Bradbury’s nostalgic America, is maleness ripe for so short a span? I liked this question, found in a reading guide, because I think it captures the essence of this book. It's really about nostalgia for boyhood and being that ideal young man. I think it's probably Bradbury's own fascination with it that shows; in Dandelion Summer, another book in the loose "Green Town" series that this book is part of, the heavy scent of nostalgia for boyhood is the entire theme. I'm not sure why the golden age for these boys and men is so short though. There are a couple of moments in this book that can be uncomfortable for a modern female reader -- Lori commented in our last halfway-through discussion about "Will's Dad and his thoughts about that time of day ("..a living death...), the immortality of women through their children and what is perceived as a carefree existence because they don't have to worry about having any other accomplishments in life. It's a very provocative concept." In another section, Will's Dad seems to conflate gossip with the source of the Pandemonium Shadow Show's darkness as well as with "women" in general. How did you read these comments? 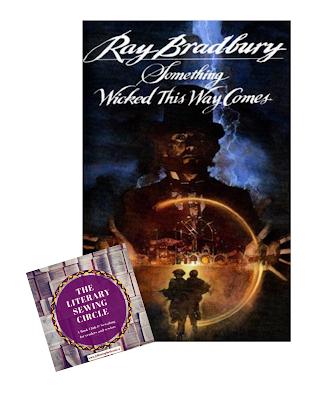 Were they something that bothered you or did you read them as part of Mr. Halloway's character, or of the era? Of course, I disagree with both of Mr. Halloway's ideas about women's immortality through their children and their predilection to gossip. They both reflect the maleness of Bradbury's world, and especially the era in which this was written. The dismissal of women as people with an equally rich inner world to those of the Halloway men, father and son -- the depiction of them as entirely focused on home and relationship -- I think that it's obvious there is a lot more to life than that. I found Mr. Halloway not entirely sympathetic both for these comments and for his self-pity about being "old". This element didn't ruin the story for me, but it was a little nudge and reminder to watch for these things and to be conscious of the author's perspective in a story. And Sara asked in our last discussion: "Did anybody expect that the actions of Mr Dark would ever be reversed? For example, Miss Foley. Did anybody expect she would ultimately be rescued in some way?" I have to agree, I had thought that Miss Foley would be rescued by the boys near the end. She had been so developed as a character I couldn't picture her just disappearing forever. It does give a sense of finality to one's poor decisions when everything isn't magically fixed, even if the ringmaster is taken down. Kind of a terrifying thought these days, really. What about you? What did you think of this book? You can answer these questions in the comments, or just talk about what you want to about your reading. No, I don’t think I would like to go on the Merry-go-Round, at least not knowing what the consequences would be. I am in fact, going on a Merry-go-Round today with my two year old granddaughter and I am really looking for it. So, I think there is a child in all of us regardless of age, but what we are seeking is fun, and memories of fun. But I certainly don’t want to go forward fast, I feel my life is whizzing past me already. And I don’t want to go backwards and do it all again. I like this stage in my life! I think for the same reasons as I gave above. We all want to remember our ‘fun’ days. Ray Bradbury’s book is nostalgic, but can we still connect to that nostalgia? Do we experience the book as earlier generations of readers did? I think we can. I believe it is ageless – young teenagers wanting to be older. I can remember feeling that way oh so many years ago. Interestingly, I do believe ‘childrens’ books in the years that this book was written did have children this age doing things so much older than their years. I am thinking the Milly Molly Mandy series, Arthur Ransom books – Swallows and Amazon series, many Enid Blyton books. There appeared to be so much more independence – not realistic. I haven’t really read many teenage novels these days, but the whole concept is a little different. The male characters of the book, in the beginning at least, are all looking forward or back to a narrow sliver of time as the prime of their life. Why, in Bradbury’s nostalgic America, is maleness ripe for so short a span. I am not sure about this one. Looking back can mean looking back to a time where life was carefree, (for some). But we are also looking at a small section of society. Life is not fun for many, regardless of age or time in life, or period of time. Looking ahead teenagers may think they will have more control, more independence when they are older. Looking back, the older person may well be looking back to when they had less responsibility, less cares. Is there ever such a perfect time, or is it all in the imagination, all in our dreams? Maybe that is why we say ‘a narrow sliver of time’. There are a couple of moments in this book that can be uncomfortable for a modern female reader……Will’s dad and his thoughts about that time of day (“a living death…), the immortality of women through their children and what is perceived as a carefree existence because they don’t have to worry about having any other accomplishments in life. In the 50’s & 60’s women were possibly still viewed by many men as having these traits. Maybe men felt that because they were considered the bread winner, that women were home and therefore carefree, and their role was primarily to bring up children, hence the concept of immortality of women through their children. Regarding the link between gossip and women, I believe this must have been the general feeling of that time. I remember recently going to an aircraft war museum and reading all the booklets and instructions the pilots and aircraft maintenance crews were given. In bold print there was clear instructions, never to talk to women about their work – because of the risk of gossip! I cannot remember the exact wording, but I was amused. It reflected the beliefs at the time when men had certain roles in life, predominantly ‘important’ work and that women could not be trusted to keep their silence. I wasn’t bothered by all of this in the book – I remembered I was reading a book written in 1962, which probably began inception in the 1950’s and by an author who clearly represented the belief system of that time. If the same book was written now, I would be very indignant if I thought the author actually believed all these concepts! !